All contractors (writers, editors, influencers, designers, developers) will be graded on assignments they complete within the CopyPress CMS. This article will help you become familiar with the performance ratings process and meaning. NOTE: All performance ratings (excluding onboarding tests) received before 3/30/2018 were erased. What is a Performance Rating? A performance rating is an evaluation of the quality of your work and your ability to follow directions on a specific assignment. Your individual assignment ratings will combine to provide an overall Performance Rating. The scale is a letter-based grading scale and the breakdown is found below. To be accepted as a contractor through the onboarding, you need to score at least a C on your practical Writer or Editor test. Your onboarding score will be your first performance rating. As you complete more assignments, the score will become an average of all ratings. Note: If you were a CopyPress Contractor before the new CMS, then you won't receive a rating until you complete your first assignment inside the new window. Where is your Performance Rating? When logged into your user dashboard within the CMS, you'll see a "Performance Rating" section in the top right corner. If you click "View ratings" it will open another window that breaks down your ratings. A. Performance Rating: In this box, you will see your overall rating which is cumulative. This score will include all work completed across every position. In other words, if you are a writer, editor, and influencer, this grade will include your scores across all three positions. In addition to "Overall," you can also see your yearly and monthly grade. B. # of Performance Reviews: This box functions similarly to the previous box in that you will see the number of reviews you've received in totality as a contractor, and you'll see total reviews yearly and monthly. C. Individual Review Details: This section will show you every review that you've received in the CMS. If you have just completed the onboarding, you'll only see the review for your practical test(s). The longer you work for CopyPress, the more reviews you'll receive, and you'll be able to assess each rating you are given. 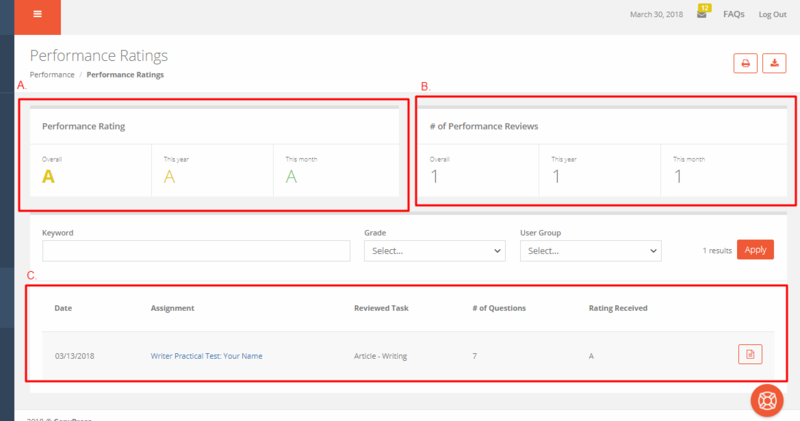 You can click on the assignment, select the paper icon on the right of the assignment details to open the actual rating to see your star-rating and the feedback. You can also filter your rating list by "Keyword" - "Grade" - "User Group" to narrow down your ratings easier. Assignments in the CMS are based on tasks within the workflow. 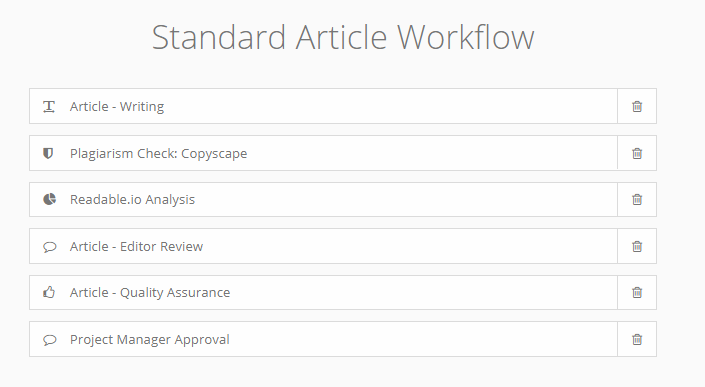 For instance, our "Standard Article Workflow" starts with Article - Writing which is where the Writer actually writes the content. It then goes through a Plagiarism Check via Copyscape and a Readable.io analysis before reaching the Editor. After the editor completes their stage the article then goes to a QA-Member to double check the content with the style guide and other quality metrics. Finally, it goes to the Project Manager for approval. As the article moves through the workflow, the succeeding contractor reviews the previous task owner's submitted work. In other words, if you are the Writer, you will be reviewed by the Editor. If you're an Editor, you'll be reviewed by the QA-Member. If you are the QA-Member, you will be reviewed by the Project Manager. The goal is to place accountability for the entire project on each individual task owner within the workflow. Regardless of where you fall in the workflow, knowing that the succeeding team member will review your work should push you to provide a flawless piece. How is your Performance Rating Used? It's important to note that your performance rating is hidden from all external users. It's only visible to you and our internal project management team. We understand that privacy is important to our contractors, so your grades are not made public. We also understand the flaws and subjectivity with contractors rating other contractors. Therefore, your performance rating is not the defining factor for whether you'll receive ongoing work. In addition to your performance rating, we keep internal records and notes on all our contractors. Moreover, our project managers recruit and build teams for specific campaigns -- meaning, once you are tested on a project and perform well, you will likely become an active member of that project regardless of your letter grade. If you receive a low rating, read through the notes and grading to understand why you received the grade you did. If you review your rating and still don't believe it's a fair representation -- please contact us to assess. Your performance rating is obviously important, but it's not going to completely deter you from receiving work. However, if you do receive frequently low grades it is likely indicative of a larger issue of quality or inability to follow directions, which could result in warnings and the ultimate termination from our community. If you are turning in quality work in a timely manner, you should have a satisfactory performance rating. If you're delivering low-quality content and missing important formatting or style requirements, you will likely see a lower rating. All contractors should strive to submit work that meets the quality and style requirements outlined for the assignment.